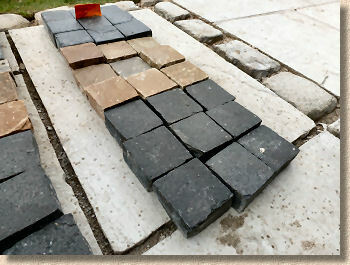 Black limestone paving, also sold as "Kadapha Black" and various fancy but meaningless names, has become phenomenally popular over the last few years. Its dark tones suit the current trend for a monochrome palette; it's hard-wearing; it's readily available; and it's very reasonably priced. However, there is one feature that many of the suppliers selling the stuff somehow fail to mention: it doesn't stay black for long once it's exposed to the sunlight, even the pathetic, wishy-washy sunlight we think of as 'Summer' in Britain and Ireland. and weak sunshine has had a chance to bugger it up! 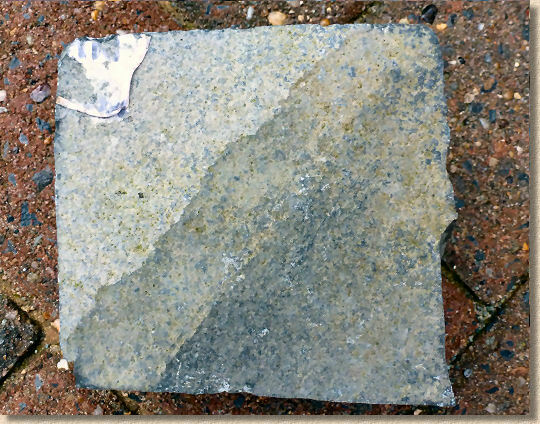 Essentially, after 2-3 months of being out in the open, exposed to wishy-washy UV light and slightly acidic rainfall, the stone starts to fade to a sort of steel grey. Now, that's all well and good if you were prepared for it, or if that is the colour you actually wanted, but a large proportion of buyers choose it because it's black, and they expect it to stay black, so when they notice that it's no longer as dark and sombre as they recall, they tend to get a little bit irate, and this is when the suppliers suddenly start going on about "natural variation", "typical weathering", "characteristics of the stone", and that perennial favourite, "unrealistic expectations". Unsurprisingly, none of these offer much comfort or solace to the distraught customer. And if the sunlight and rain doesn't get it, there's a good chance some eejit who claims to be a paving contractor will bugger it up by cleaning with hydrochloric acid or an acid-based patio cleaner. Acid and limestone (which includes marble and that bloody awful Travertine) is NEVER a good idea. 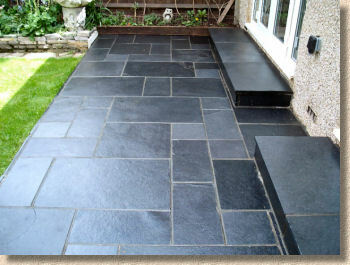 Acid and black limestone is the perfect recipe to ruin the stone forever. 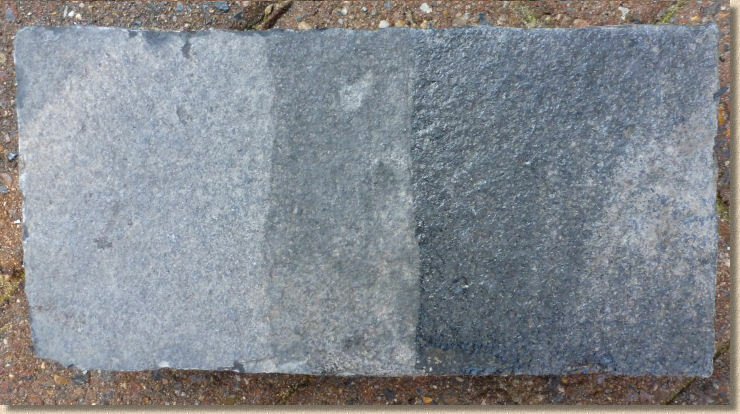 Black limestone instantly bleached by some pillock attempting to clean mortar stains with acid. We know from personal experience and feedback from the hundreds of contractors that use this website that a 'good quality sealant' can prevent or at least alleviate the problem, and we've seen jobs where faded limestone has been given a new lease of life by treating with a sealant of some kind. In reality, what was being referred to as a 'sealant' would sometimes turn out to be a 'Colour Enhancer' or an 'Impregnator'. For the remainder of this page, whenever the term 'sealant' is used, it should be read as meaning any of these products. We started out with a range of 13 different products of various chemical composition, from PU sealants, to siloxanes, acrylics and more. 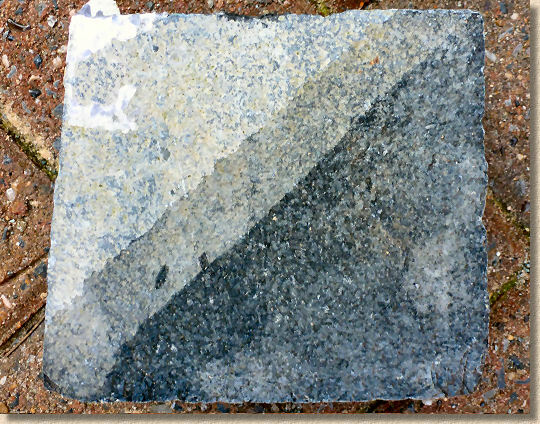 The tests on new limestone were carried out on 100x100mm setts in two forms: a simple riven/cropped sett, and a sawn-and-tumbled sett. 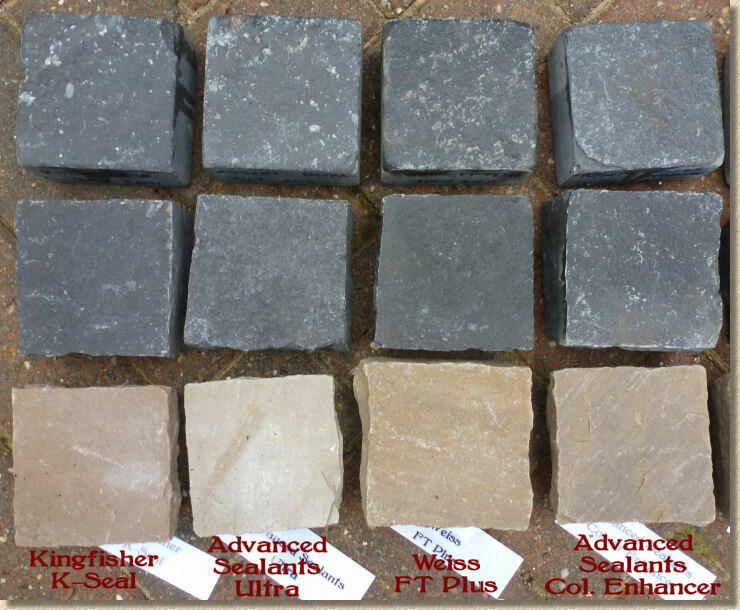 At the same time, the products were tested on a riven Raj sandstone sett, just to give an indication of how well the various products coped with different substrates. 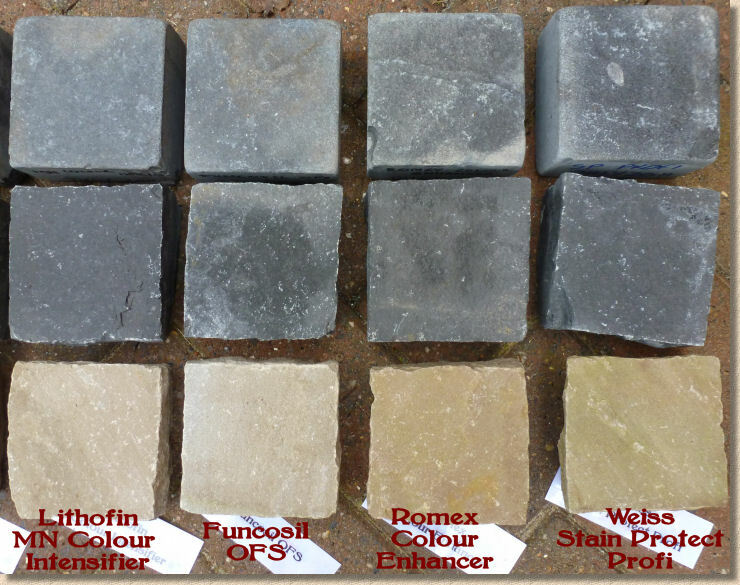 For the colour restoration trial, we sourced a number of limestone setts that had been exposed to the Great British outdoors for 3 years and had faded to the usual steel grey. 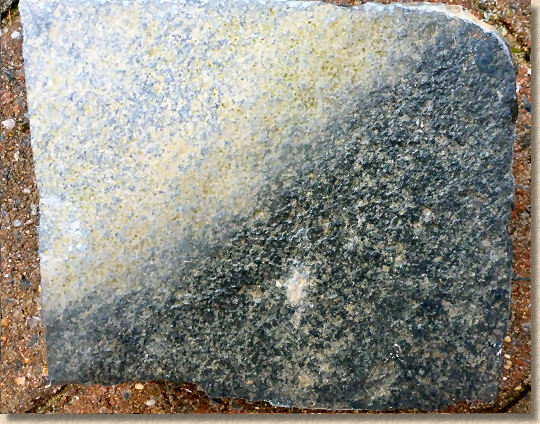 For the first trial looking at protection against fading, setts were randomly selected from several thousand being used on a project for a private client and then a minimum of three setts of each type were given a single coat of the product and left in the open from July 2011 until April 2012, to ensure they received a reasonable blast of sunshine as well as enduring a fairly typical British winter and spring. 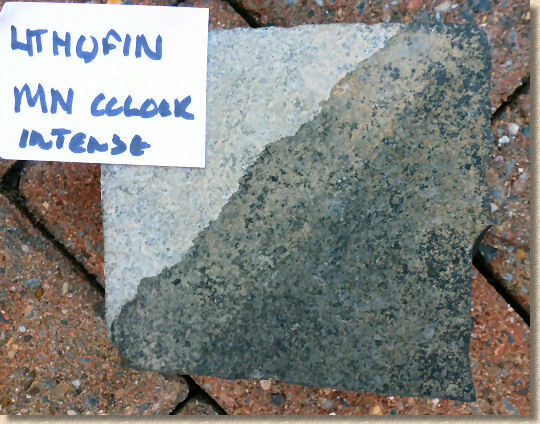 For the colour restoration trial, the salvaged setts were covered to approximately one-half to two-thirds of their surface with a single coat of the selected product. This was allowed to cure as per the manufacturers' instruction, and then a second coat was applied to approximately one-third of the surface area, so that it would be possible to see untreated, single coat and dual coat on each sett. 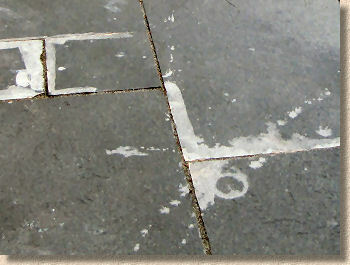 It is possible to produce quantitative results which would measure how dark the surface was at the end of the trial period compared to the original surface, but the High Tech Research Facility at the bottom of the garden doesn't yet have the very expensive equipment necessary to carry out such measurements, and so we are limited to qualitative assessment, which essentially means comparing the setts visually and trying to determine which have faded most, which have stayed dark, and, in the case of the colour restoration trial, which setts had recovered their colour and retained it over the course of the trial period. Obviously, this is highly subjective, and with a limited number of sample setts to compare, the results should be regarded as indicative rather than definitive, which is techno-babble for saying the results give an idea of which products fare best but should not be regarded as proof. 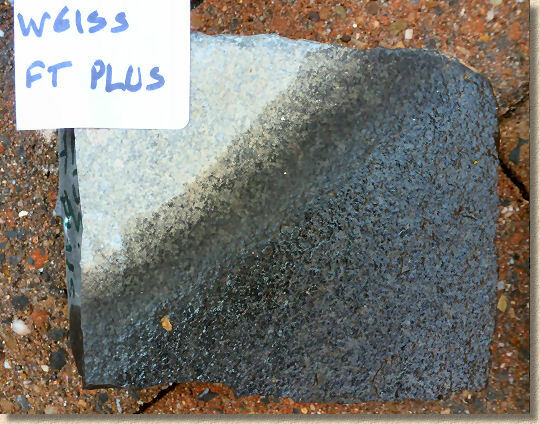 ...and if one product had to be selected as performing slightly better on both the riven and the sawn limestone, as well as the riven sandstone, then that accolade would go to the Weiss FT Plus. 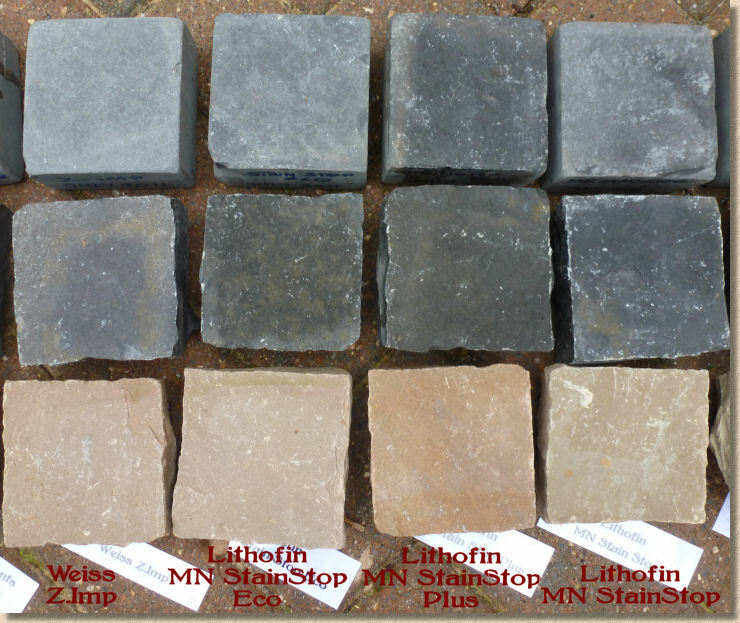 However, these were very small samples, just 3 setts for each product, so your results may vary. Also bear in mind that there is significant variation in cost between these products. You will need to do a sort of cost:benefit analysis to see whether the cost of the product you'd like to use is justified by its performance. And finally, just because a product didn't feature in the "Top Four" doesn't mean it's not worth considering. The differences between a top-four and a top-ten product is minimal. 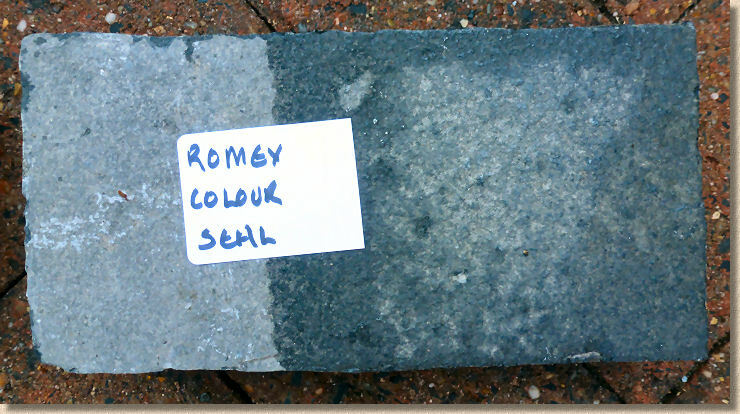 When considering the results of the colour restoration trial, the results appear to be much more clear cut, with the Romex Colour Seal bringing back a deep, dark black tone and maintaining that depth of colour throughout the period of the trial. It's worth noting, however, that two coats were needed to achieve this result, although all the samples were given two coats. 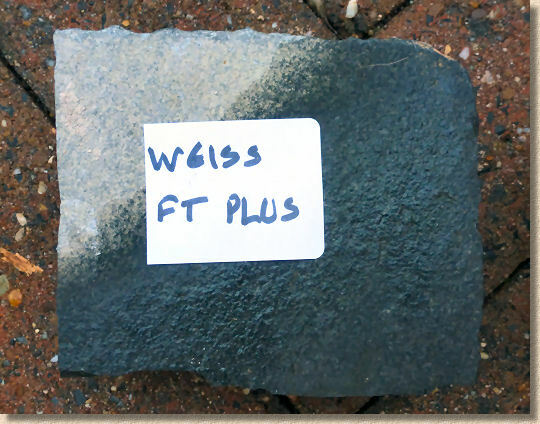 The Weiss FT Plus was a very close second and only lost out, in our opinion, because of the slightly glossy finish which we felt detracted somewhat from the texture of the stone. 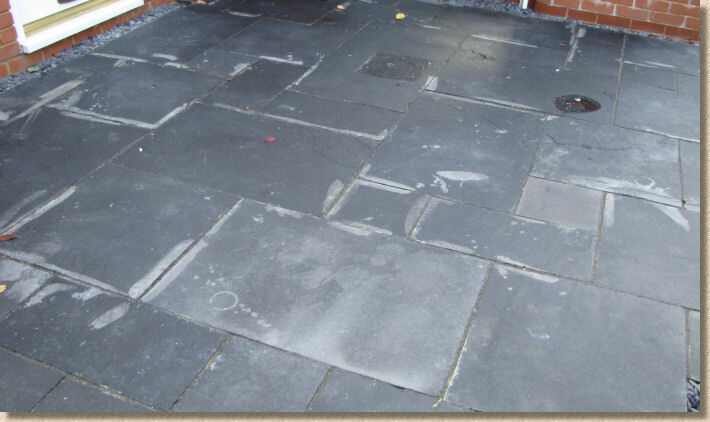 1 In the light of what these trials have revealed, if the dark colour is preferred we would recommend that new black limestone should be treated with one of the products listed above 4-8 weeks after installation. This delay allows any efflorescence in the mortar to make itself known and also gives time for any problems with the installation to be identified. 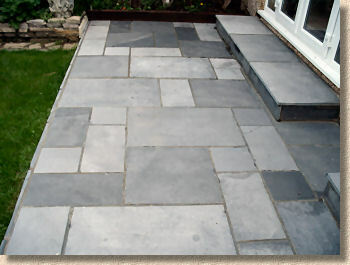 2 We would recommend that the paving is cleaned with a non-acidic cleaner and/or hot soapy water and then given at least 48 hours to thoroughly dry before applying a sealant. 3 Further, to ensure depth of colour and a longer service life from the sealant, two coats should be used, ensuring that the manufacturers' instructions are followed to the letter and that the first coat is allowed to cure before applying the second. 4 Much of the advice given above applied equally to colour restoration. 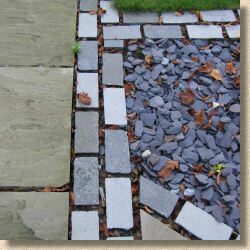 The paving should be thoroughly cleaned beforehand, to remove any surface dirt, lichens, weeds etc. and given plenty of time to dry completely prior to applying the product. 5 Again, two coats does seem to give best results and initial results suggest that coverage more than doubles with the second coat. Some of the issues that have been brought up in emails over recent monthsâ€¦. 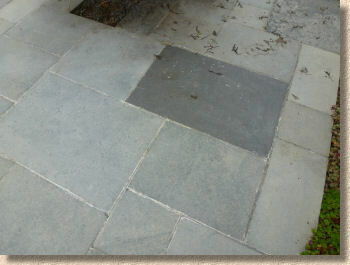 My contractor used acid to clean mortar staining from the edges of the flags, resulting in highly-obvious streaks. Should we treat the whole of the affected flags with acid in an attempt to bleach them all to the same degree? Some contractors have claimed to lessen the impact by using an acid wash to bleach the whole pavement surface, but the results I've seen for myself have been patchy, at best. Further, when done successfully (sort of) the flags are rendered pale grey, not the black which is usually the main reason for buying the flags in the first place. There is a real risk that acid washing will make matters worse. In some cases, the original mild bleaching around the edges is lightened even more by an acid wash, and the result is a flag that has been bleached to grey throughout, with extra bleaching on those parts that were originally damaged. 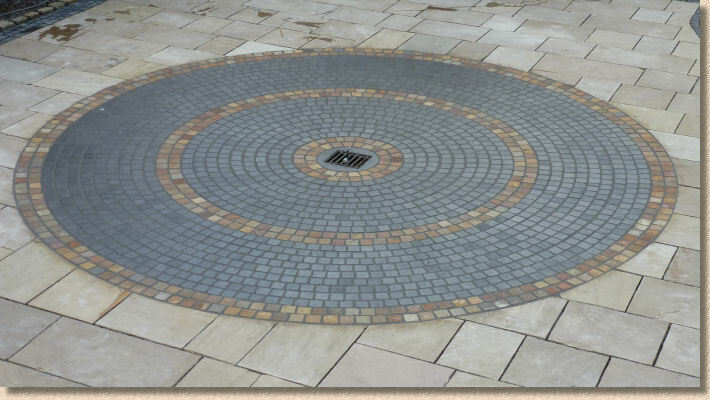 Also bear in mind that any acid washing will cause damage to any cement mortar as well as affecting the surface of the paving. 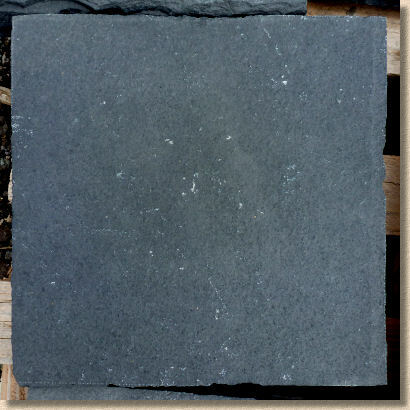 My supplier suggested having the paving sand-blasted to remove the areas burned by the acid. Will this work? In theory, yes. 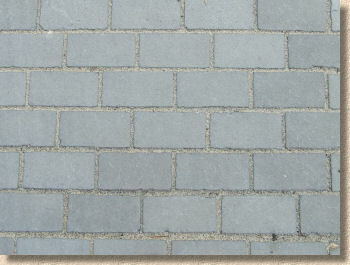 Sand- or grit-blasting will abrade the bleached surface and expose a fresh, unaffected surface. 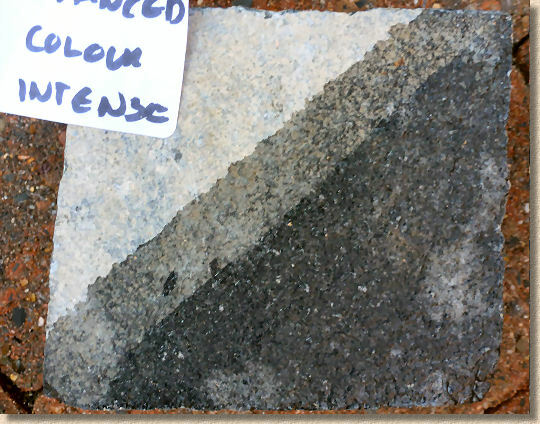 However, it can sometimes require the removal of two or three millimetres of the surface to get down to stone that hasn't been affected by the acid. 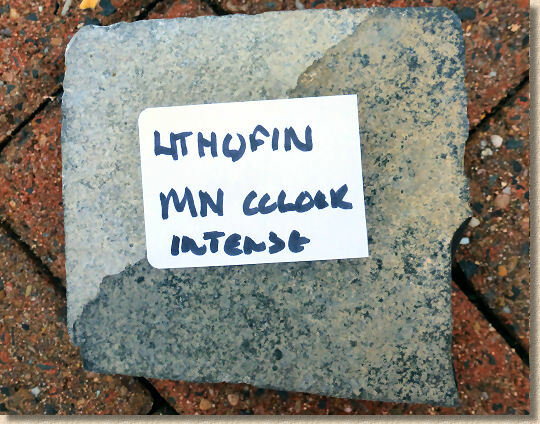 This process will inevitably alter the surface texture of the paving, and the usual result is a smoother, less natural-looking finish which lacks the characteristic riven styling that many people find attractive. It should also be borne in mind that the cost of blasting can be almost as much as, if not more than, the cost of replacement paving, especially for smaller areas. And finally, remember that blasting is a dirty, noisy process. Could I use Colour Enhancer just on the bleached areas to return them to original colour and make the bleaching disappear? Pretty unlikely. 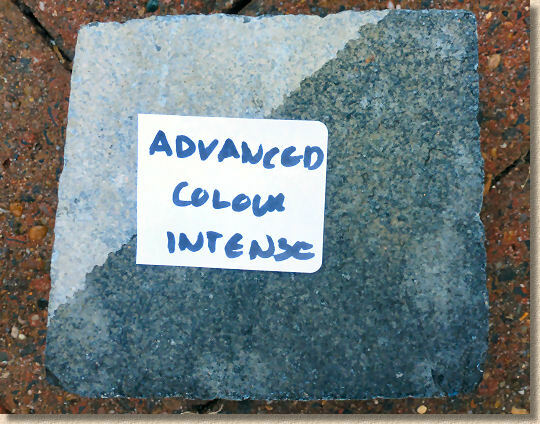 There's little chance that you'd be able to apply just the right amount of the Colour Enhancer to match the original colour of the stone. 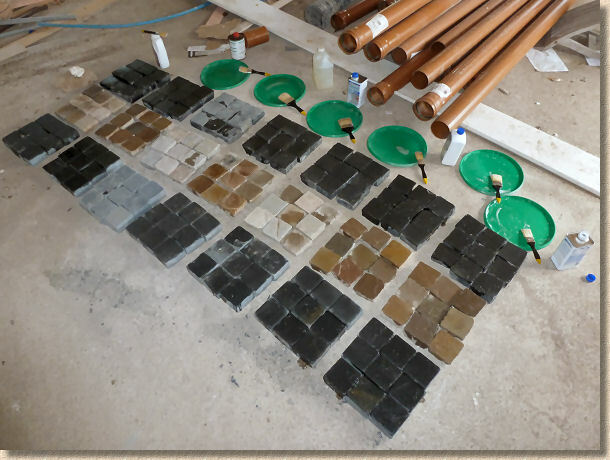 Further, most of the products we tested work by creating a damp or wet look to the stone, so this would not match the untreated areas. 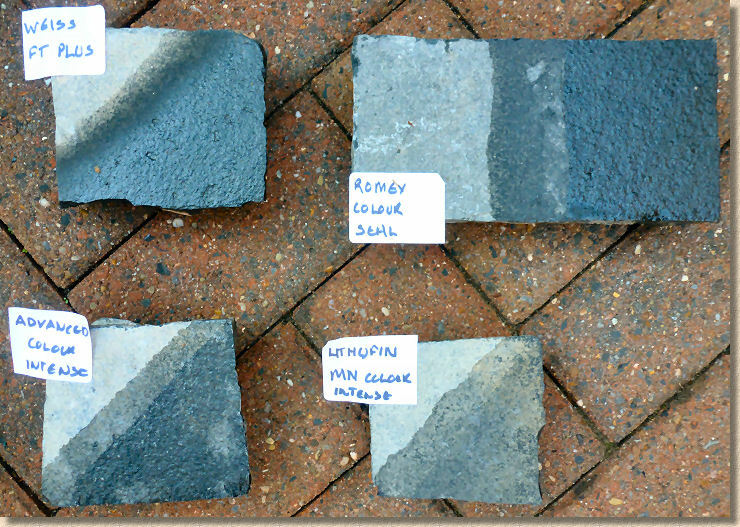 And think about what happens to the paving over the longer term. 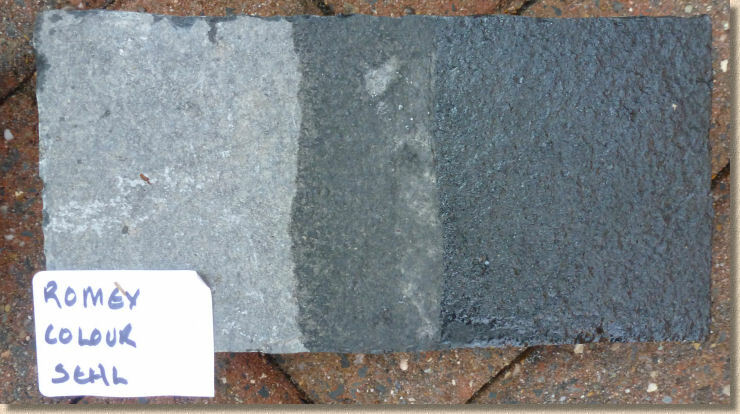 The untreated areas of paving will naturally fade but those parts daubed with the Enhancer could remain darker for longer, and so create a sort of "reverse bleaching" problem.